The human skeletal system is formed of two types of highly specialized connective tissue: cartilage and bone. Together, they provide support and protection for various muscle tissues and organs, as well as playing a vital role in locomotion and movement. Cartilage and bone are made up of collagen, an extracellular matrix, and the cells which synthesize them. Their differences lie in the nature and proportion of the ground substance and fibrous elements present in their matrix. Cartilage is a special form of connective tissue comprised mainly of cells called chondrocytes and chondroblasts, as well as an extracellular matrix (ECM) formed of fibers and ground substance. The cells synthesize and secrete the extensive extracellular matrix, and are located in matrix cavities termed lacunae. Collagen, hyaluronic acid, proteoglycans, and small amounts of several glycoproteins are the principal macromolecules present in all types of cartilage matrix. They give the cartilage its flexible semi-rigid consistency, making it ideal for bearing mechanical stresses without permanent distortion. Variation in the composition of the matrix components give rise to three types of cartilages: hyaline cartilage, elastic cartilage, and fibrocartilage, all of which are adapted according to local biomechanical needs. Hyaline cartilage is the most common type of cartilage. It contains primarily collagen type II fibrils embedded in a firm hydrated gel of proteoglycans and structural glycoproteins. In embryos, hyaline cartilage serves a model for most of the bones. As an individual grows, the cartilage becomes gradually calcified into bone by a process called endochondral ossification. In a full-grown adult, hyaline cartilage persists throughout life only on the articular surfaces of bones, the ends of ribs (costal cartilage), and the walls of larger respiratory passages (nose, larynx, trachea, and bronchi). Elastic cartilage is similar in appearance to hyaline cartilage, yet more pliable and distensible. In addition to collagen type II, it has abundant branching elastic fibers within its matrix. Elastic cartilage occurs in the auricle of the ear, the walls of the external auditory canals and tubes, the epiglottis, and the larynx. 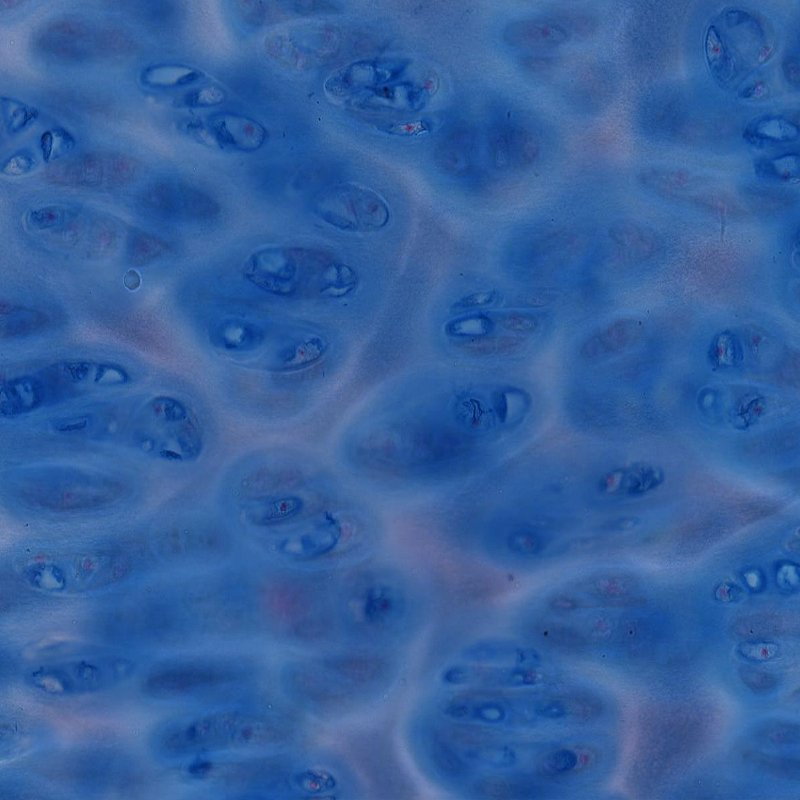 Fibrocartilage is characterized by containing alternating layers of hyaline cartilage matrix and a dense irregular network of coarse type I collagen fibers. It has limited distribution in the body, present only in regions subjected to pulling forces. Fibrocartilage is found in the intervertebral disks, certain joints, and the symphysis pubis. In all three types, cartilage is avascular. It is nourished by the diffusion of nutrients from capillaries present in the nearby sheath of dense connective tissue called the perichondrium, or from synovial fluid present in joint cavities. Like cartilage, bone is a specialized form of connective tissue. It is comprised of three types of cells: osteocytes, osteoblasts, and osteoclasts, as well as fibers, and an extracellular matrix. Osteocytes are inactive osteoblasts trapped within formed bone. They assist in bone nutrition. Osteoblasts are present along the bone’s surface. They synthesize the organic components of the bone matrix (osteoid) and control its mineralization. Osteoclasts on the other hand are multinucleated phagocytic cells, capable of bone erosion. They play an important role in the constant turnover and remodeling of bone tissue. Mature bone is made up of 70% inorganic salts and 30% organic matrix. The coarse collagen type I fibers constitute more than 90% of the organic components, the remainder being ground substance proteoglycans (comprised of chondroitin sulphate and hyaluronic acid), and non-collagen molecules like osteocalcin. The inorganic mineral component consists predominantly of calcium and phosphate. Magnesium carbonate, sodium and potassium ions can also be found, but in very minute amounts. The mineralized bone matrix makes bone harder than cartilage. Diffusion in a calcified bone matrix is impossible. Therefore, the external and internal surface of bones are covered by layers of vascular connective tissue called the periosteum and endosteum respectively. In a bone cross section, two types of bone can be seen: compact bone and cancellous (spongy) bone. Compact bone comprises the dense outer cylindrical part of a long bone. Its collagen fibers are arranged in thin layers of bone called lamellae that are either parallel or concentrically organised. In a long bone, lamellae that are deep to the periosteum are termed outer circumferential lamellae. Those surrounding the bone marrow are the inner circumferential lamellae. And those enclosing blood vessels, nerves, and loose connective tissue are the concentric lamellae, which are also known as osteons or Haversian Systems. The central Haversian canal is the space that contains the blood vessels and nerves of an osteon. Cancellous bone is found deep to compact bone and adjacent to the marrow cavity. It contains numerous interconnecting areas, and is more porous than compact bone. The only difference between these bone types is the extent of porosity, they have the same microscopic appearance. Want to learn more about the Cartilage and bone?